Triangular design and non-slip grip moulds ensure a comfortable hand writing experience over long periods of time. 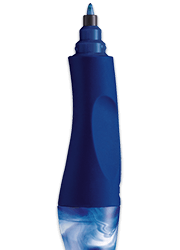 The first ergonomic rollerball especially designed for left- or right-handers. The ideal fountain pen for beginners - ergonomically designed for left- or right-handers. Ergonomic children’s fountain pen for children between the ages of 8 and 10. Innovative, ergonomic pen design – specially developed for kids who are just starting to write. 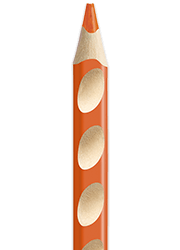 The very first ergonomic colored pencil for pre-school kids and school children aged 5 and over. When functionality meets design! 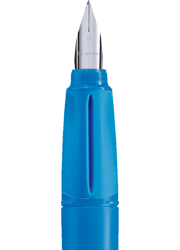 The ergonomic EASYsharpener can sharpen three different lead diameters. Learning to write is almost as difficult as learning to play a musical instrument. To engage with children and to ensure that they pay attention it is important to fill learning with fun and to make them discovering the joys of handwriting. We want to help make learning to write a simpler and more relaxed process for children. Therefore STABILO cares strongly about promoting neat, flowing handwriting and specializes in ergonomic shaped pens and pencils developed with experts and specifically designed for left and right handers. What does the CE mark on some STABILO products mean?What does the CE mark on some STABILO products mean? Our products with CE markings are children's toys which conform to all the relevant requirements set out by the European Community. In addition to legislating upon the toxic elements contained in children's toys and similar, the Toy Safety Directive includes the core stipulation that components and contents (e.g. the lead, varnish or wood in wooden pencils) may not be classed as dangerous to health, toxic, corrosive, irritant etc. The product thus presents no danger to the child under normal conditions of use or from reasonably foreseeable misuse. Occasional “biting or sucking” is included under reasonably foreseeable misuse. Labelling products as “non-toxic” is not permissible in the context of children’s toys, as it must constantly be borne in mind that colours also contain chemicals, which although not dangerous to health, are still to be considered as chemicals. Nevertheless, raw materials are extensively analysed and the composition is not dangerous to health. 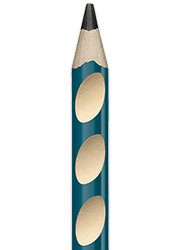 We recommend that drawing pencils and child-friendly fibre pens are only given to children aged 3 and up, as younger children often put pencils in their mouths. From age 3, it is safe to assume that this only happens from time to time accidentally and that such behaviour is not prolonged. Are all STABILO pens also suitable for children?Are all STABILO pens also suitable for children? 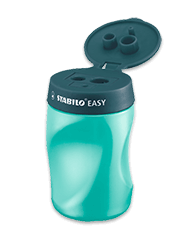 The STABILO EASY Start range is specifically adapted to the needs of small children or those starting school. Ideally, however, children aged under 3 years old should not play with writing instruments unsupervised. Why are the STABILO EASYoriginal cartridges not transparent to show the ink level?Why are the STABILO EASYoriginal cartridges not transparent to show the ink level? The STABILO EASYoriginal sets standards in terms of ergonomics and writing comfort. In addition to this, we have also done something to stop blue fingers. In contrast to conventional ink cartridges, the EASY cartridge is protected against leaks. Even a damage which would cause a conventional ink cartridge to leak completely, our ink system holds the ink in a sponge-like reservoir. This reservoir is, of course, coloured according to the ink and stays this colour even after the ink is used up completely. A transparent cartridge would therefore not help to show the ink level.